I once heard a story that Pastor Joel Osteen shared. He said a man was married to his wife who had 80% of the qualities he loved and adored. However, she was missing 20% of the other things that he wanted. So he found another women who had that 20% and he left his wife. Later he found out that this new gal definitely had the 20% … but she was missing the other 80%! Does it seem like some folks believe if they were just somewhere else, with someone else, doing something else, they would be happier? So that got me thinking …. 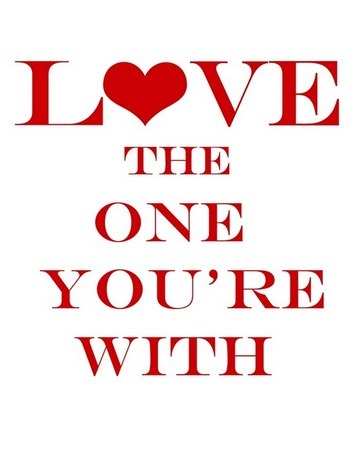 Imagine how much happier people would be if they simply … loved the one they were with! Love the partner you’re with, the kids you have, the friends in your life, the parents you were given. Same goes for the job you have, the car you drive and the house you live in. Life is just too short to waste it away thinking about being someplace else with someone else and having different things! PreviousPrevious post:L-O-V-E: What You Do …NextNext post:L-O-V-E: What’s Chicken Got To Do With It? I love 80% of what you wrote in your article, but let’s give Discontentment it’s due. That is what guides us to do better, be more creative and leads us to fulfillment. I do agree that we should relish each moment we share with others, I mean as long as we are there anyway. So from now on until my love-o-meter drops below 50% I am loving it. (Except for family because we’re kind of stuck with that situation). There are no coincidences 🙂 Thanks for the comment! Steve thanks for the comment! Sure discontentment can nudge us to improve and I think some folks spend an awful lot of time focusing on what isn’t there instead of what is … especially in relationships and work. Sometimes the difference between happy and discontent is how we choose to see things or people.